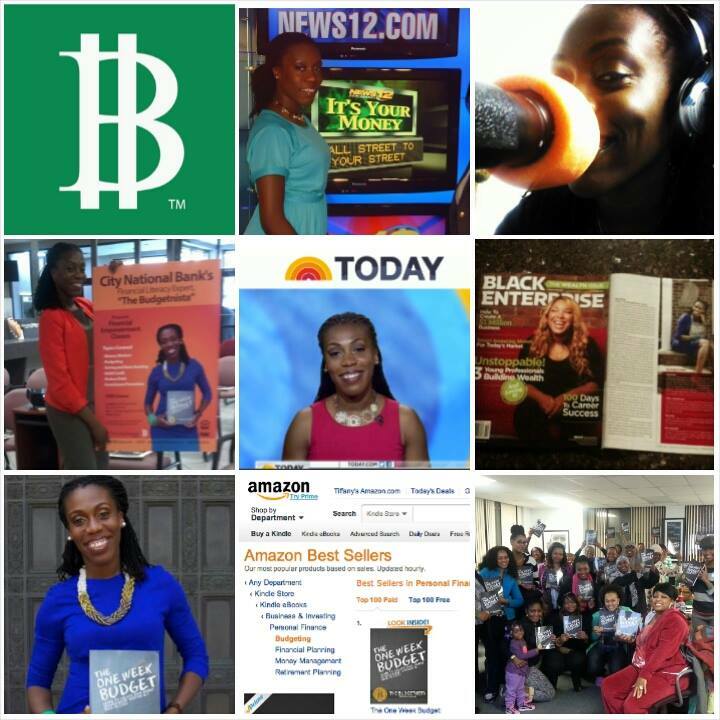 Self made financial expert, Tiffany Aliche “The Budgetnista” has taken the financial world by storm and has now taken on the task of helping entrepreneur’s build better businesses. I was very honored to be able to document her progression in the world of finance and business. See below how she got started and learn more about how you can build a better business. Rhenotha: Why and how did you get started with being “The Budgetnista”? The Budgetnista: I grew up in a household where finances were openly discussed. My father was a CFO of a non profit and he was also an accountant and taught us about money early on. I was always good at managing my money and people always asked me questions. So I was doing it before I made it into a business. When I lost my job during the recession in 2009 I said well why not turn this into a business. So here I am. Rhenotha: Was it an easy transition into your business when you lost your job or did you meander over it for a while or was it something that you always knew you were going to do? The Budgetnista: I meandered over it for a while so for two years I didn’t know what I was going to do. I said to myself, let me just start volunteering and I started volunteering for different non profits in Newark and one of the ways I volunteered was writing curriculum; I was a teacher before so I started writing financial programs and I started to become very popular and organizations continued to ask, Can we have Tiffany back, how much does she cost? After hearing that for a while I thought oh well here is a business but it took about two years to get there. Rhenotha: What was the first thing that solidified the Budgetnista? The Budgetnista: My first contract with the United Way. You don’t have a business unless someone is paying you. So when I received my first payment I said to myself ok someone is willing to pay and pay good money for this. Rhenotha: Did you see opposition or weigh yourself against other people who may be doing the same thing? The Budgetnista: No not really because I was lucky enough to start the business in Newark which is in the shadow of New York. In New York, you can say you make cat sweaters and there are literally other people who make cat sweaters too. But in Newark its great because there was really no one else teaching financial literacy outside of banks and financial institutions. Rhenotha: How did you begin to gain national exposure? The Budgetnista: It started with local exposure. This is what I tell all new entrepreneurs. Before you get national exposure you have to lock your hometown down! One of my friends met Jay Z once in a parking lot and he asked him How do I get on? How do I get famous? Jay Z said, you have to first lock your hometown down. That really struck me. What that means is that, before I can get Oklahoma to care, I had to get Newark to care, so I started there. My goal was, anytime someone mentioned financial literacy in any room or group, my name had to be brought up and that was my goal. They may not choose me or hire me but at least they said, what about that Tiffany Budgetnista girl. That was my goal, letting everyone know what I was doing, networking, talking to other entrepreneur’s ad using social media. So that was my goal to lock my hometown down. When you lock your hometown down, you don’t have to chase national exposure because your local exposure will spread the word for you. Rhenotha: Do you work 24/7 or 25/8? What is balance to you? The Budgetnista: *Laughs* All the time 7 days a week! I know it’s cliché but, It’s important that you have to decide if you really love your business because it’s going to make you cry before it makes you money. Sometimes, people have chosen something for the money aspect but it may be 3 or 4 years before you see any money. It has to be your passion, what’s going to keep you going if you don’t have passion? If its something that you love then that’s enough. Rhenotha: Within those 3 or 4 years before you are actually making money, where does your support come from? The Budgetnista: For me, i’m in the business of learning to not overspend so when I lost my job I had two years worth of savings and plus I had unemployment and by the time that ran out it was about 2 years in and then I got my first contract. You may have to get a part time hustle while pursuing your dream. There’s nothing wrong with that but try to find a part time job that’s related to your business that only adds to your knowledge. Rhenotha: What are some costs and rewards of being an entrepreneur? The Budgetnista: There is some freedom about this life. Even though I work a lot, it’s by choice, but I decide what I want to do when I want to do it. In the beginning I said yes to everything but now I’m in a position where I don’t have to take every job. It took me a while to get there. What you do for a living is your life, but you love it. On the other side it takes a lot of time because being an entrepreneur can be pretty lonely. When you are working on your goal everybody doesn’t get it, they say OMG you’re obsessed so it can be ostracizing because people don’t get it, in some ways you have to be self centered about your business because if you’re not focused you’re not going to make it. Rhenotha: Tell us about the new arm of The Budgetnista; helping people build their business. The Budgetnista: So what I noticed is that so many entreprenuers would reach out to me and ask me questions and second to financial literacy, entrepreneurship is probably one of my favorite things to talk about. I find that I was spending a lot of time on the phone sometimes to the detriment of my own business teaching another entrepreneur how to do something specific to their business. I would say sure but then I thought about it and said that’s not pertinent to “The Budgetnista”. When people ask for financial help I always give that away. I’ve even structured my business in a way that people don’t ever have to pay for it. I have free classes, I have my blog and other avenues where people can ask financial questions and I answer them. I feel like basic financial education should be free, it’s like food, shelter, clothing, it’s a necessity this day in age. But it’s one thing to ask Tiffany can you help me figure out a way to feed my kids, of course that’s basic financial literacy. But if you say Tiffany can you help me build my business where you are profiting from the advice that I have given you. It’s only right that I have to be compensated for that. If i’m helping you to make money now you’re using my advice to put more money in your pocket not to live your basic life. So that’s why I decided to go forth with B2B (Business to Business). I’ve launched it on Facebook (for free) 23 people hit me up and about 10 of those are really serious so we’re moving forward. B2B is under CLD which is the name of my Parent company and it stands for Control Lead Develop. I teach how to get on the Amazon Best seller, how to market and grow your brand, how to use social media to get clients, how to write a proposal and how to pitch yourself for a proposal. Rhenotha: Where do you see the budgetnista in the future? The Budgetnista: I see myself as a spokes person and continued teaching. But for my ten year plan, what I really see for the Budgetnista is beyond The Budgetnista. I don’t want people to see the Budgetnista and think Tiffany. I want one day that you go into your local Target and you are choosing between 2 hair dryers. If you see my B, you know that the product with the logo is Budgetnista certified. If the dryer is $20 I’m certifying that the dryer is worth more. So my B is a symbol of value. Ergo sales spike with items that have my logo and a company pays me a certain amount of money because of my certifications. Of course it has to be a product that I believe in. So yes I see Budgetnista as a larger brand and it is something of value when you see it. Rhenotha: One important tip for others looking to start their business? The Budgetnista: Nothing magic, Ggt started.! I know a lot of people who were saying, that they wanted to do this, they wanted to do that. But you need to just get started. The business will tell you what to do; you just need to start somewhere. You have to be strategic about starting your business. Most people think too big. They want a bakery but they don’t have money for the bakery or money for the overhead. What does that have to do with you going to the store, buying some flour and making some cupcakes and selling them at your job? Whatever you want to do, you have to think to yourself what does that look like if you have to do it tomorrow. Oprah wasn’t even Oprah when she started! She was in some local station with no make up artist, no hair stylist and a crazy set. If you want to write, start a free blog, if you don’t have a computer go to the library on Friday’s and post every Friday. If you really want something you will find a way to do it, with or without money! I had my sister’s couch and a baby computer doing a tip of the day. Something in you has to say, I’m going to do this no matter what. You have to get started! If your business isn’t working you’re not working. http://thebudgetnista.com/ and check her out there.